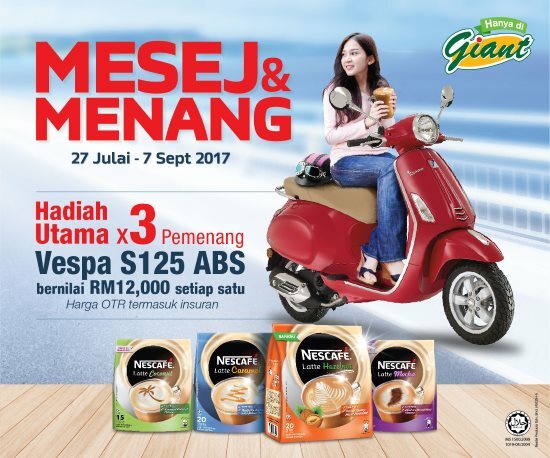 Purchase at least one (1) or up to twenty four (24) of any participating NESCAFÉ LATTE products as shown in Contest's poster in a single receipt from any participating Giant Hypermarket in Peninsular Malaysia. Write your full name, I/C number and tick the products and total purchase on the receipt. Take a clear photo of the receipt which shows clearly the hypermarket's name, purchase date (which must be within Contest Period), the purchase of the participating NESCAFÉ LATTE and the total purchase. Send the photo via WhatsApp or MMS to 013-2322168. Visit Peraduan NESCAFÉ LATTE Mesej & Menang eksklusif di GIANT contest page for more details.